Okay, this isn’t news. I’ve blogged about Puree before and it’s now been about 2 1/2 weeks since I was actually there and ate the meal pictured here. It was absolutely, positively, perfect banana bread heaven. And I just had to share. 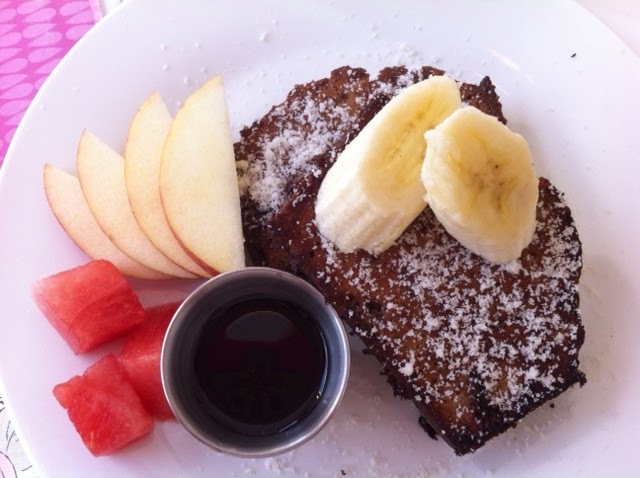 They take two thick slices of banana bread and prepare them just like you would for French toast. Genius. 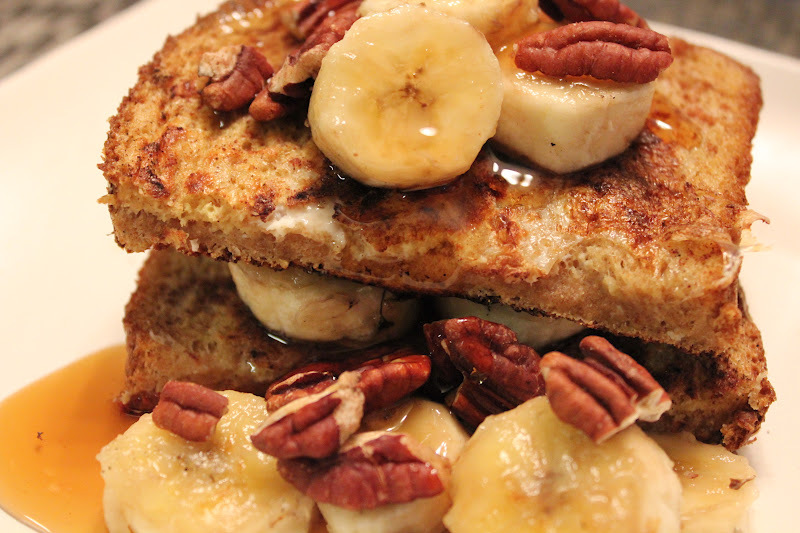 The toast is dusted with powdered sugar and topped with more banana slices. It was so moist and flavorful; I didn’t want it to end! I ate as slowly as I could, which was just fine because I was a single girl that morning. Greg was out of town for a bachelor party so I took advantage of my alone time. 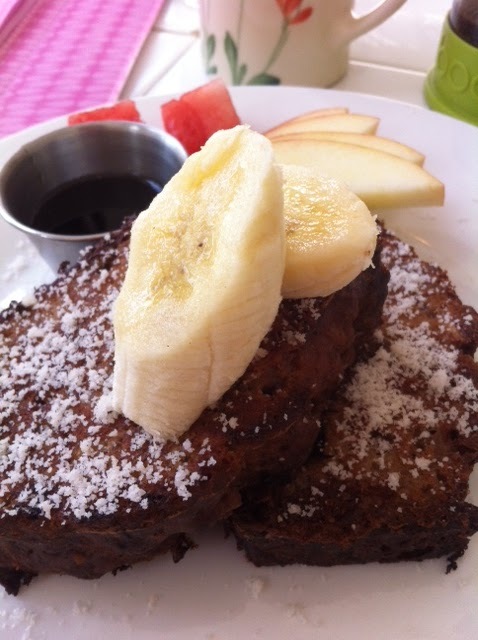 I cherished every bite of the French toast along side my hot coffee poured directly from the French press. The bright, yet cozy, feel of Puree makes me feel like I’m at home. Did you make the overnight oats I shared with you yesterday yet? If you haven’t, that’s okay. Just save that for next week when you need something quick and easy before heading out the door early in the morning. Weekends call for something a little more indulgent. A little more…delicious. 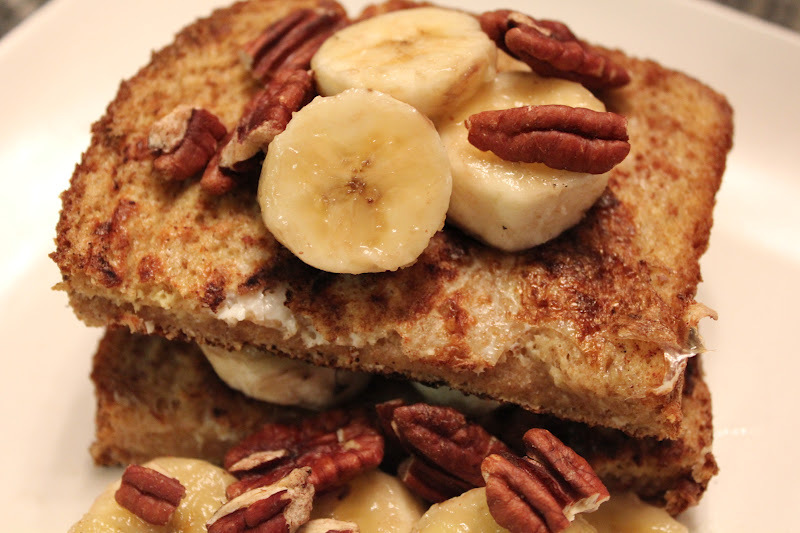 Like this Banana Nut French Toast. Needless to say, he was with me on this one. 1. In a small bowl, combine eggs, milk and cinnamon. Whisk until eggs are beaten. 2. Heat large skillet to medium-low. Once heated, dip bread (one slice at a time) into the egg mixture to coat completely. Immediately add to skillet. Cook about 1-2 minutes, flip and cook another 1-2 minutes. Remove from skillet and keep warm in oven set to 250 degrees if necessary. Repeat with remaining bread slices. 3. Once all bread has been toasted, turn off stovetop. Add sliced bananas and pecans to skillet while it is still warm. Use a spatula to gently move slices around. Let cook about 30 seconds, then flip banana slices over. Let cook about another minute then remove from skillet. 4. 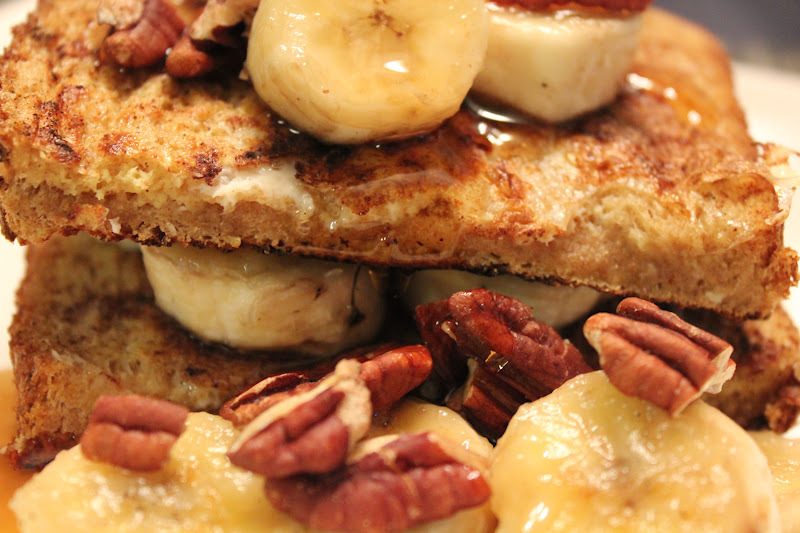 Layer french toast slices with bananas on plate. 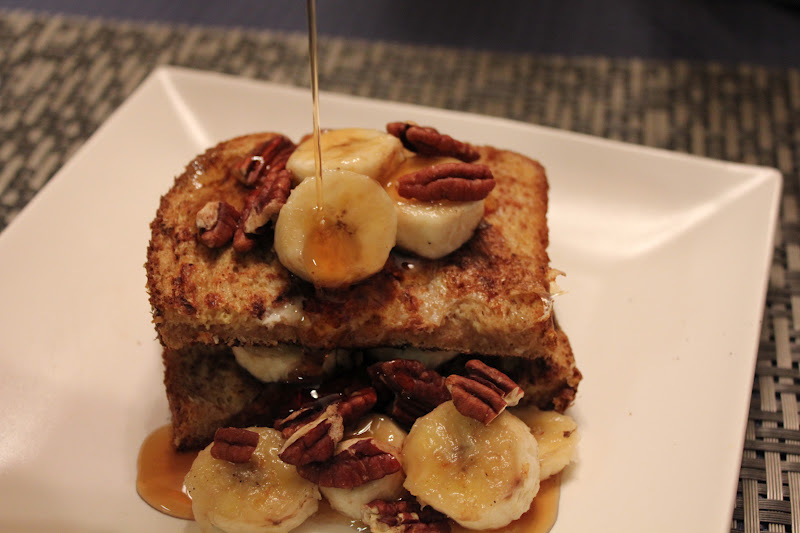 Top with pecans and syrup. What did I have for dinner last night, you ask? It’s been awhile since I’ve had big ole plate of pancakes and bacon for dinner. Oh how I’ve missed thee. 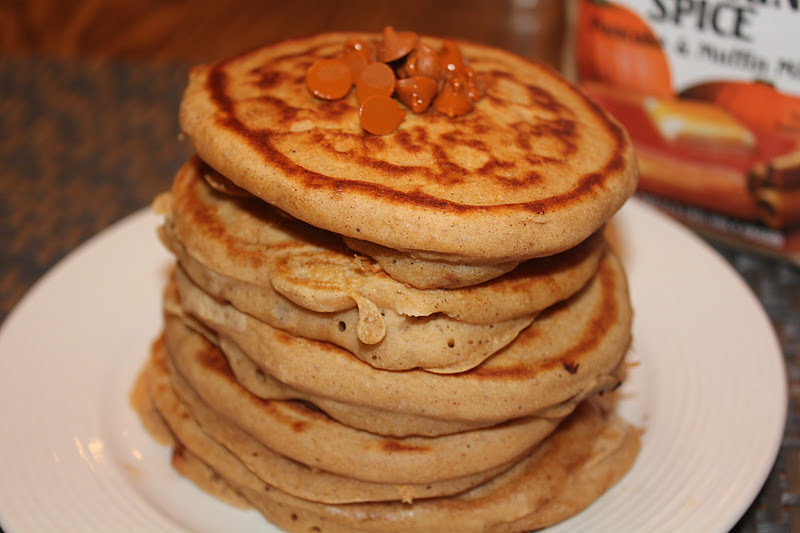 I have to say, the Whole Wheat Banana Bread Pancakes (recipe via How Sweet It Is here) I made last night were not quite as good as some of my others, like these Fluffy Buttermilk Pancakes or these Pumpkin Pancakes. That’s not to say they weren’t good, but just not my favorite. And that’s okay. Sometimes you just need to change things up and try something new. 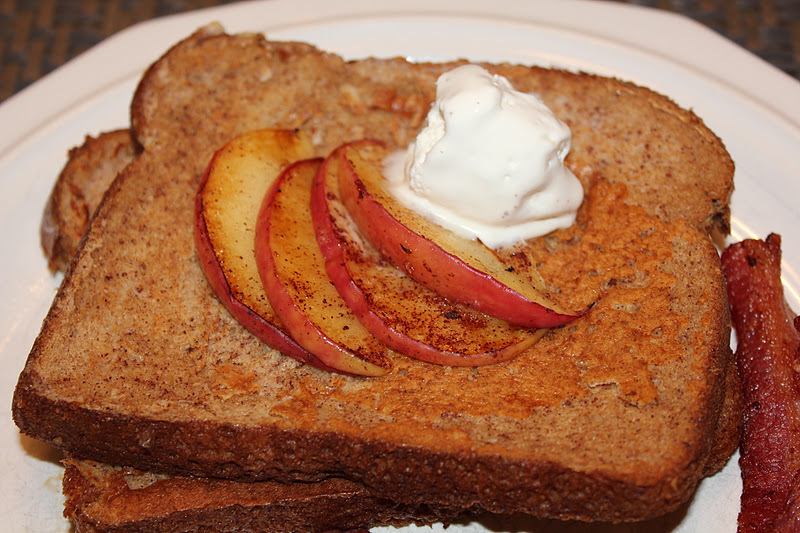 Do you need to try something new with your breakfast (or breakfast-for-dinner rather)? Here are a few ideas to incorporate different flavors into every breakfast-lovers favorites: Pancakes, French Toast and Waffles! Pumpkin pancakes from a mix. It doesn’t get much simpler than making pancakes from a mix. You won’t be making the best pancakes ever, but pancakes from a mix can still be pretty decent. I’m not going to lie, I pretty much grew up on Bisquick pancakes. And I enjoyed them. Add a little fruit or chocolate chips to kick it up a notch if you’d like. Or find a flavored mix like this pumpkin spice one. A few years ago (maybe even a several years now), stuffed pancakes starting popping up in breakfast restaurants everywhere. I’m pretty sure stuffed french toast came first, but whoever decided it would be a good idea to stuff pancakes is brilliant. Being far from healthy, I avoid ordering stuffed pancakes for myself. Meaning I take a few bites from those who do order them! One time, I tried making my own version at home and they turned out great…not to mention much healthier than the restaurant kind. 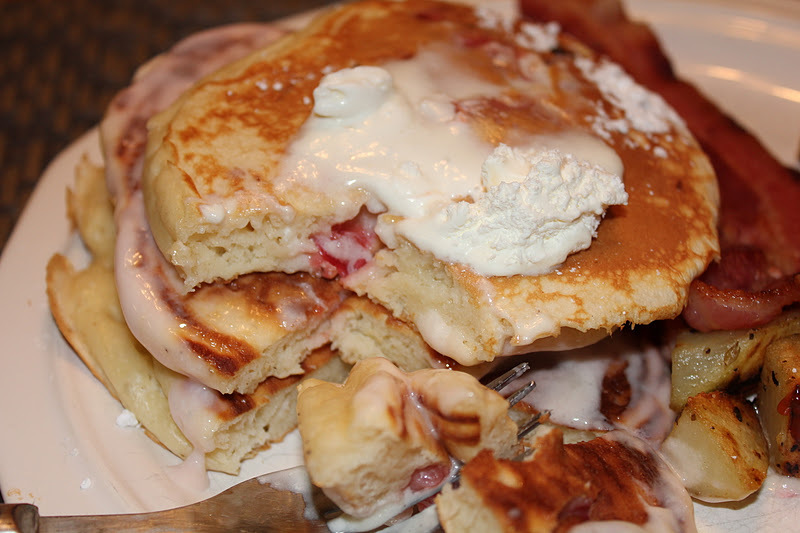 I basically used my plain Fluffy Buttermilk Pancake recipe and layered non-fat strawberry yogurt and freshly sliced strawberries between each one. Add a scoop of whipped cream on top and you are set. Seriously. You don’t even need syrup with this one. Ok…maybe a little syrup. But the yogurt adds most of the moisture you need. 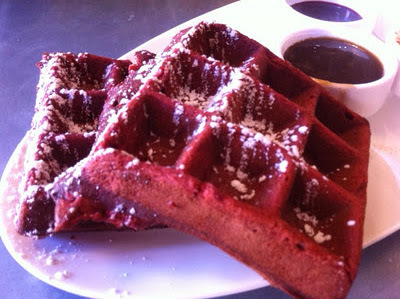 I wish I had a waffle recipe to share with you too, but that’s hard to do without a waffle iron. Here’s a little inspiration for you though. If you can make these for me I’ll be your best friend. Please share with me in the comments your favorite way to make pancakes, french toast or waffles. I’d love some new ideas!